Electrical current can be generated by moving a metal wire through a magnetic field. This applies both to alternating current (AC) and direct current (DC) electricity. This is a different method than where DC is created by a battery, which uses chemical reactions. It is also different than static electricity, which is the accumulation of charges on a surface. Electrical generators rotate a coil of wires through a magnetic field. The difference between an AC and a DC generator is that the AC generator uses slip rings to transfer the current to the electrical circuit, while the DC generator uses a split-ring commutator. Generators can be very small or quite huge. Very large ones create electricity for the community. An electric motor is very similar to a generator, except that power is provided to turn the rotors. What happens when a wire moves through a magnetic field? How is a loop of wire used in an electric generator? What do commercial generators look like? When a wire made of conducting material cuts through a magnetic field, an electrical current is created in the wire. Note that the wire must be part of an electrical circuit. Otherwise the electrons have no place to go. In other words, there is no electrical current produced with a wire with open ends. But if the ends are attached to a light bulb, to an electrical meter or even to each other, the circuit is complete and electrical current is created. The direction of the magnetic field and the direction of the wire will determine the direction of the current through the wire. By convention, the direction of the magnetic field is from N to S.
Years ago, Benjamin Franklin defined the direction of electrical current as going from plus (+) to minus (−). At that time, scientists were not aware of the existance of negatively charged electrons and their role in electric current. Thus by convention, the current goes from plus (+) to minus (−). But note that in reality, the negatively charged electrons move in the opposite direction of the current. Electrons move from (−) to (+). You'll just have to remember that the electrons move in the opposite direction than the convention for the direction of current. Besides moving a wire through a magnetic field, you could also create an electric current in the wire by moving the magnets and keeping the wire stationary. Another technique to create a current is to keep both stationary but vary the magnetic field. That method is used to change the voltage of AC in electrical transformers. (See AC Transformers for more information). If the wire is made into a loop that is then spun or rotated in the magnetic field, you can have continuous current. Since each side of the loop is going in a different direction in the magnetic field, the current flows around the loop, depending on which direction it is rotated. There must also be some way to transfer the current to the rest of the circuit. In an AC generator, having a ring on each end of the wire does this. A metal contact or brush rubs or slides against each ring, allowing the electricity to flow through the circuit. In a DC generator, this is done using one split-ring called a commutator. An AC generator uses two slip rings. The following animation shows an AC generator in action. As one side of the loop moves to the other pole of the magnetic field, the current in it changes direction. The two slip rings of the AC generator allow the current to change directions and become alternating current. 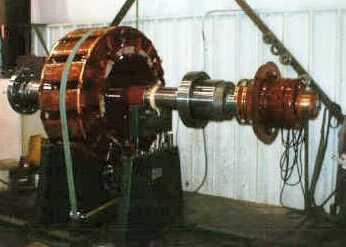 In a DC generator, the split-ring commutator accommodates for the change in direction of the current in the loop, thus creating DC current going through the brushes and out to the circuit. Note that the DC current is not a steady value. Rather, it is a "bumpy" signal, with zero voltage at the break in the ring. The power from the current could be mathematically described as a sine wave squared. Since most DC generators have many more than one loop, the "bumps" even out and are not noticed. The faster the wire passes through the magnetic field, the greater the current. Instead of having a single loop, generators used to supply electricity to homes and businesses have multiple magnets and loops consisting of wires wound around an iron core, similar to an electromagnet. The more loops of wire passing through the magnetic field, the higher the voltage that is created. Generators used to provide electricity to the community are huge. The rotor can be well over 10 feet in diameter. Note that when a generator has its wire wound around an iron core, it can also be used as an electric motor. Instead of rotating the loops through a magnetic field to create electricity, a current is sent through the wires, creating electromagnets. The outer magnets will then repel the electromagnets and rotate the shaft as an electric motor. If the current is DC, the split-ring commutators are required to create a DC motor. If the current is AC, the two slip rings are required to create an AC motor. Examine an unplugged electric motor to see how both a motor and generator looks inside. 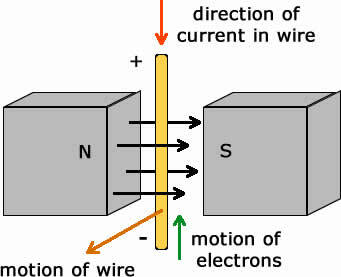 Moving wire through a magnetic field generates electrical current. Electrical generators rotate a coil of wires through a magnetic field. The difference between an AC and a DC generator is that the AC generator uses slip rings to transfer the current to the electrical circuit, while the DC generator uses a split-ring commutator. Very large generators create electricity for the community. An electric motor is very similar to a generator, except that power is provided to turn the rotors.